Thanks a bunch for the endearing support and those resplendent, walloping 237 entries for my first event, 'Cakes, Cookies and Desserts'. Truly speaking, when I thought of announcing this event, I was almost quivering with anxiety for the entries, but now I'm equally frenzied with such a banging number. My heartfelt gratitude salutes you all and I am intoxicated with the sweetness of all these delectable desserts and bakes. Since I used the 'linky tool', so I'm not uploading the entries individually again, rather copy pasting the link here. I'll be doing so in two parts, and this is the first round of it. As I had announced, there is definitely a surprise gift waiting for the winner who has been chosen by random.org. All the entries were wondrous, and if I had to choose one, I would possibly end up killing myself for not finding one, but thankfully I switched to Random Selection. Here's the round-up of the first 110 linked entries and 5 received by e-mail. 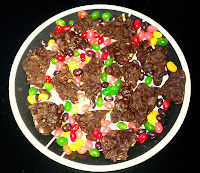 Also, there are special laurels and accolades for a few entries that were unrivaled and sinful. Soak the cashews in warm water for 2-3 hrs, wash them and grind into smooth paste. Keep it aside. Now add the cashew nut paste and cook it on slow flame, stirring continuously; cool it slightly, till your palm could bear the heat for kneading. Knead fora couple of minutes till it forms a dough or till the cashew paste starts letting oil go. Then divide the dough into two equal parts. In one part mix the strawberry crush, and the second part remains plain. Now take the plain dough and roll it with a rolling pin forming a small rectangle shape (about your palm size) between two plastic sheets. Take strawberry cashew dough and do the same. Place one sheet over the other, and between two sheets place some crushed almond and cashews. Roll it tightly, and cut it into circles. 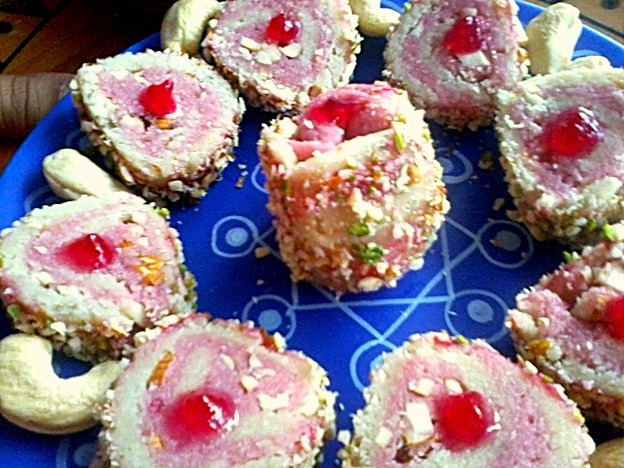 Roll is ready; now dip the edge of rolls in crushed pistachio, almond powder with the help of strawberry crush. Take 1 Kg Milk and bring it to boil and keep boiling it and stirring till it becomes semi solid (Like Mava). Put off the flame and add 4 tbs sugar. Add 2 tbs Cocoa Powder and mix well. 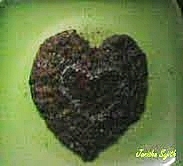 Empty it in a plate & form the shape of a heart using knife. Sprinkle Cocao powder & sugar for decoration. Cut the apples in half & take out the seeds. Now peel them & cut them into fine slices. Put the apples in a large pan with a tbsp of water, 1 tbsp of sugar, a little bit of butter & a pinch of cinnamon powder on low flame & cover it & cook for 10 min. Now in a large mixing bowl, add aata/whole wheat flour, maida/APF, butter & 1 1/2 tsp of cinnamon powder. Mix everything with your hands to the consistency of bread crumbs. Now add sugar & mix well.Your crumble is ready. Take a microwave safe bowl, spread the cooked apples evenly in the bowl. Add all the crumble mix. 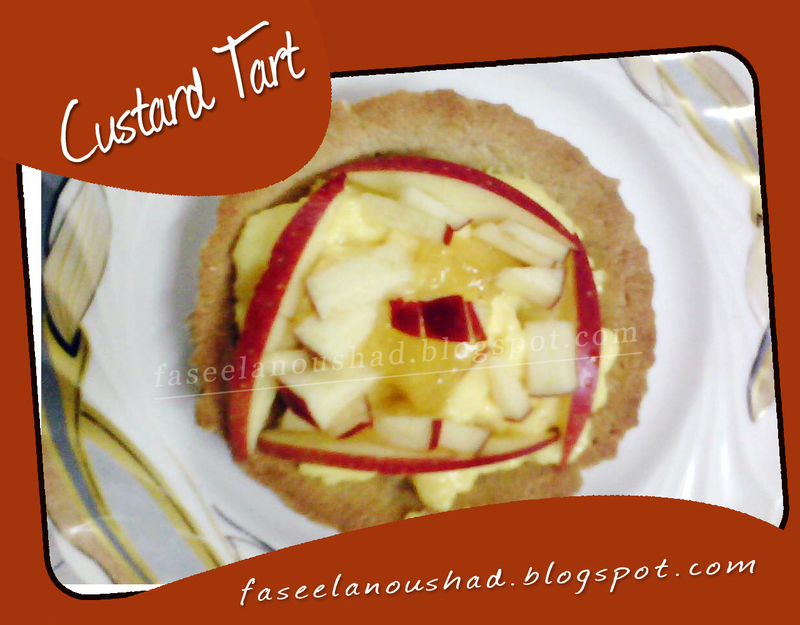 Just spread it evenly on apples but don't press it. Put the bowl in oven (I used an old electric aluminium oven) for about 30 min or till you see the crumble turns light golden brown. 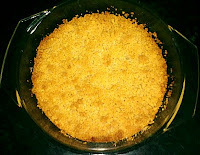 The Apple Crumble is ready to be popped in. Wonderful round up with delicious recipes. Great round up. Congratulations Anjali. Nice roundup, thanks for choosing mine as one among the innovative dishes..
Lovely round up,and thanks for the award. Aishwarya is on cloud nine when I told her about the special award her mini cupcakes got and has asked me to convey her special thanks to you. thank you so much for the mention!.....honored!